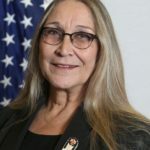 This article was original posted on the Administration for Community Living (ACL) blog by Cynthia LaCounte, ACL/AOA Director of the Office for American Indian, Alaska Native & Native Hawaiian Programs. In November, we observe Native American Heritage Month. We celebrate valuable tribal traditions and commemorate our rich history. Native American citizens have long faced challenges which are unique, and tribal culture has enriched the lives of many in our communities across America. We hope to increase awareness of both, to ensure lessons from the past are preserved across generations, to share the rich gifts of tribal culture with all Americans, and to help people who work with and support Native Americans better navigate our world. Pictured at left is Cynthia LaCounte’s Grandmother, Tresa Portra LaCounte Holzmer, a tribal elder of the Turtle Mountain Band of Chippewa in North Dakota. Working in aging services has given me a unique perspective for reflecting on the benefits of the tribal culture I grew up in. Family is integral to our customs, and we particularly celebrate our elders and respect their ideas and points of view. That’s just the way it is in Indian Country so I never really thought much about it as a kid. With the benefit of age and experience working in aging services, though, I can see how much stronger we are as a people because of this cultural value. My grandmother, Tresa, was an elder of the Chippewa tribe. I spent lots of time with her in my life because she was always really fun, and I only had her. Everybody in the community called her “Gramma.” I could bring all my friends over, and I loved spending the night. I remember at Halloween time, a couple days before, we used to get little bags and you’d put penny candy them. Gramma and I would do that together, and I loved doing that kind of stuff with her. We’d decorate gingerbread cookies. We’d play solitaire. We’d work on puzzles, and she taught me to cook (she was a fantastic cook!). She taught me so many life lessons by letting me work alongside her, and by making the work fun. She was just an amazing, amazing woman. As Gramma got older, my kids and I moved back home so we could be close. Without thinking about what we were doing, we’d make sure we would take her out for meals. We’d go get her groceries, and take her shopping. We’d help her clean. We’d help her in her garden. And with that bit of help, Gramma was able to continue living the way she wanted to, and my kids were blessed to have many of the experiences I had in childhood and to learn many of the lessons I learned from Gramma when I was their age. I’ve always thought that my relationship with Gramma, and my tribal heritage, led me to do what I do now. I learned about supporting older adults, and learned the value of the many ways they support the younger generations, without even realizing what I was learning. “Taking care of Gramma” grew into a vocation for me, and now I get to spend my days making sure everything we do at ACL considers the unique needs of tribes, and helping tribes take care of our elders with programs like Home-Delivered Nutrition Services, In-Home Services, and Caregiver Respite Services. I also get to work with tribes to help us do a better job. In fact, that is how the effort to build Title VI Native American aging programs got started. In Indian Country, when the elders tell you to do something, you have to do it. Well, the elders started learning about the Older Americans Act, and they told us that we needed to do better at making sure unique needs and heritage of our people were included in our programs. An Elders Conference was hosted in Arizona in 1975 to develop a plan. Today, we continue to meet regularly with the elders who guide community efforts and provide vision for the future. Most exciting, I get to see things continue to improve. My colleagues at ACL will tell you that I am always—always!—reminding them to make sure tribes are accounted for in their programs. Across ACL, we are looking for ways to do this better, and just recently we awarded an Independent Living grant that focuses on tribal areas. As we celebrate Native American Heritage Month, I want you to know that I am wholly and passionately committed to meeting the needs of our tribal elders. I still think of it as “taking care of Gramma.” I also challenge our Native American community to continue expanding efforts to care for our elders, while preserving the traditions of our culture. I also would like to take this opportunity to ask everyone to make an effort to really understand American Indian tribes. Make the time to understand tribal culture or tribal differences, and to really see and understand the culture. It is my experience that anyone who starts working with tribes for the first time participates in a unique personal experience—the customs get to your heart immediately because they are so special. Open yourself up to learn about it. Just put your foot forward one at a time and you’ll love it.